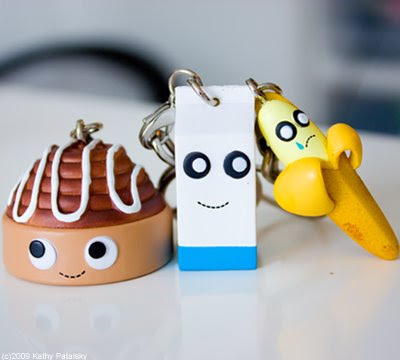 Kidrobot: Yummy Breakfast. Foodie Art that's Super Cute. What is Kidrobot? If you've never heard of Kidrobot, you've obviously never gone holiday shopping in SoHo, NYC before, the line runs out the door and around the corner. Clueless tourists and passers-by whisper, "what is THAT store?" There are a few line-out-the-door stores in SoHo. The Ugg store, the Apple store and Kidrobot. The word madhouse would be too mild. Kidrobot has some very cool artists working for them. 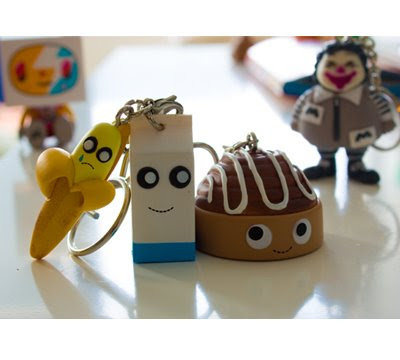 And since I can certainly relate to wacky and creative characters, aka my brand The Lunchbox Bunch, I really fell in love with the oddball creativity at Kidrobot. True, at first-look Kidrobot products are just a lot of toys and pop art images. But really, Kidrobot "stuff" is designed by genius modern artists at their best! Yummy Breakfast. This line of characters is designed by Heidi Kenney. She is awesome. Her website My Paper Crane shows how creative her brain is. 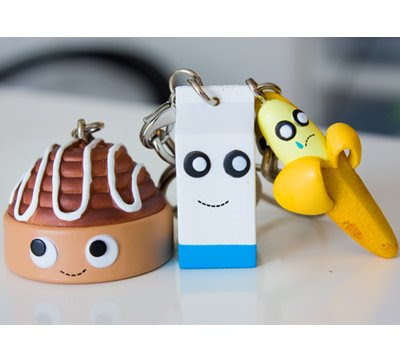 So many awesome and adorable products. I love the crying burnt toast. *The Museum of Modern Art (MoMA) acquired 13 Kidrobot toys in late 2007, which are now part of the museum’s collection. Three toys are currently on display as part of the museum’s “Just In: Recent Acquisitions from the Collection” installation. *In 2009 Kidrobot and Paramount Pictures announced that they were working on a major feature film involving Kidrobot characters, executive produced by Paul Budnitz. The film is slated for release in 2011. *Kidrobot operates store-galleries in New York City, San Francisco, Los Angeles and Miami. And new store: Dallas! *Kidrobot was founded by designer Paul Budnitz in 2002. Talk about fast business success! *The new and cooler version of "Beanie Babies" and collectible comic books? Sort've. Many Kidrobot toys are extremely rare and collectible and cannot be found anywhere else in the world. Toy artists often choose to create a series of only a few hundred or a few thousand pieces, so once a toy is sold out, it's sold out forever. Kidrobot toys retail from $6 to $20,000, and may appreciate in value over time. *Many of the toys are bought without you knowing which character you will be getting! It's luck of the draw. For Yummy breakfast I didn't know if I'd get a banana, egg, milk or strawberry! I like the bruised crying sad banana I got. He's very rare! 1 in 50 boxes as opposed to 1 in 25. The boxes tell you the odds of getting each character. So check it out if you are in the mood for some art, fun and silliness.